The origin of the Touchet family is clearly established as being in Northern France. Details about the family were provided in a book which was first published in 1911; Histoire Genealogique de la maison Touchet was written by Theodore Courtaux with the assistance of the then Marquis de Touchet. The bulk of the book deals with the history of the Touchet family in France, detailing the family on a generation by generation basis from a Richard de Touchet who lived in the early 1200s in Fresney-le-Puceux, a small village in Northern France, about 10 miles south of the town of Caen. The book, though, also provides information regarding the earliest origins of the family and mentions the connection with the Touchet family in England. The details that follow are mostly drawn from passages in the book. Ancient documents suggest this was a family based around Touchet, a village in the canton of Mortain in Normandy. Touchet (or Toscha) was an old French word meaning a small wood near a dwelling. It was not until the early twentieth century that Notre-Dame was prefixed to the name of the village. An ancient castle existed there but it was razed to the ground during the French Revolution. Rollo (or Rolf) was a Viking who towards the end of the 10th century, by means of an agreement with Charles the Simple, King of West Francia, became the first ruler of Normandy. Rollo was a direct ancestor of William the Conqueror, as the diagram below shows. As part of his agreement with Charles the Simple, Rollo was baptised into the Christian faith and took the name of Robert. The descendants of Rollo and his followers became known as the Normans (the men of the north land). There is much discussion as to whether Rollo hailed from Norway or Denmark, but the prevalence of opinion is in favour of Denmark. The first references to men being named ‘de Touchet’ are found in the period between 1060 and 1089, when mentions in charters are found of Eudes (or Odon), Hugues (Hugh) and Ursin (or Ursio). Although the names Eudes, Hugues and Ursin have ancient Germanic origins, suggesting a Frankish link, it is thought the Touchets were of Danish descent. The later use of Frankish names was probably the result of the Normans assimilation with the local population. A charter of 1089 records that Eudes de Touchet was a companion of William the Conqueror at the Battle of Hastings. The name of Touchet is inscribed on the commemorative tablets of the Church of Dives among those of the companions of Duke William who followed him to England in 1066. ‘In the charter of the first foundation of the Holy Trinity Priory of York (Micklegate Priory, founded by Ralph Paynel), depending on the Abbey of Marmoutiers (a wealthy Abbey near Tours which became a patron of churches in England after the Conquest), by Raoul Paynel in 1080, one sees among the donations by a Lord, native of Mortain, two parts of tithes enjoyed by Eudes (or Odo) de Touchet and Simon de Touchet (two tenths of the tithes from Ascelaria and Scaleberia, not counting that held by Odo) ….. in Esseby two tenths of the ownership of Simon Touchet. Dated 2nd May. We see by this act, that in 1080 Eudes Touchet and Simon Touchet resided in England and possessed goods; but as Simon is repeatedly mentioned in various charters while no further mention is made of Eudes we may presume the latter was, if not the father of the first, at least the oldest of the two, perhaps even brother of Hugh de Touchet who lived at the same time in Normandy, and that he was one of the Norman lords who accompanied Duke William in his expedition of 1066 to England. Later in the 11th century the family left their home base of Touchet but remained in the Normandy area. Close ties were initially maintained between the families in France and England, but the link gradually diminished as time passed, and it is thought the connection was finally broken when Normandy was returned to French rule in 1204. Although it is a possibility, to state that the first Touchet was a companion of Rollo is a presumption for which no proof exists. 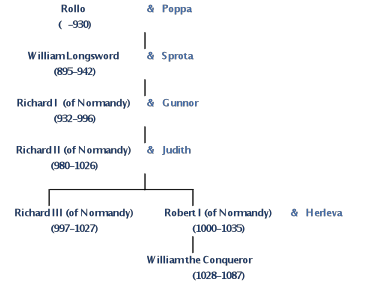 Members of the Touchet family post 1350 and all Twitchetts have William the Conqueror as a direct ancestor – hence they can also trace their ancestral line further back to Rollo. It would appear likely that Eudes and Ursin were Touchets of the same generation, possibly cousins or maybe even brothers. Time-wise it would also seem to fit that Jocelyn, the earliest Touchet found in Cheshire and the father of Orme, may have been a brother of the Simon Touchet of Lincolnshire, and that both were sons of Eudes.